At some point after that time, the Comprehensive Plan will go to the Oconee County Board of Commissioners and the councils of the county’s four cities for final action. The meeting tomorrow night will begin at 6 p.m. at Oconee Veterans Park, 3500A Hog Mountain Road, west of Watkinsville. The county has put the draft plan on its web site, asking for input there or at the meeting tomorrow night. The 82-page document has eight different chapters, covering such things as land use, transportation, and parks and greenspace. The Georgia Department of Community Affairs, a part of the state government executive branch, requires cities and counties to submit a comprehensive plan. The plan is necessary to qualify for state grants, assistance and permitting programs. The county contracted with the Northeast Georgia Regional Commission (NEGRC) for the drafting of the 2018, and update of the plan from 2008. Justin Crighton, a planner with NEGRC, has led most of the discussions of the plan with the members of the Stakeholders Committee. He has been assisted by Eva Kennedy and Jordan Shoemaker. The draft of the document on the county web site contains extensive, highlighted inserts attributed to EK. The most impactful part of the Comprehensive Plan is the Land Use Map. Applicants for zoning changes, county staff and the Board of Commissioners make frequent reference to the Comprehensive Plan and the Land Use Map to justify rezones or argue against them. The draft document contains changes in what are called the Character Areas, or general descriptions of land use, in the county, as reflected in the Land Use Map. The draft document says relatively little about sewer, though that is one of the issues occupying much of the current discussion at Board of Commission meetings. “The growth in population will continue increase the demand for sewer capacity and increase the timeline to replace existing aging systems,” the Plan states. The plan does say the county should encourage residential development that fills gaps in existing developed areas, rather than spread development throughout the county, and that has impact on sewer services, as more dense development requires sewer service. The county should identify locations and land for expansion to maximize the population served, according to the document. The county also should connect new and existing parks and greenspace to the community with trails, sidewalks and other offstreet facilities. The draft document says the county needs a multi-use trail network to connect greenspace, parks, and other trail networks, and the Oconee River and Apalachee River. The report relies heavily in the transportation chapter on documents from the Metropolitan Planning Organization, MACORTS, that serves the area of the county north of Hog Mountain Road. It does not address the U.S. 441 route through the county or other issues, such as the timing of the improvements to the Oconee Connector and SR 316, that have dominated much of the local discussion of transportation in the county in recent years. 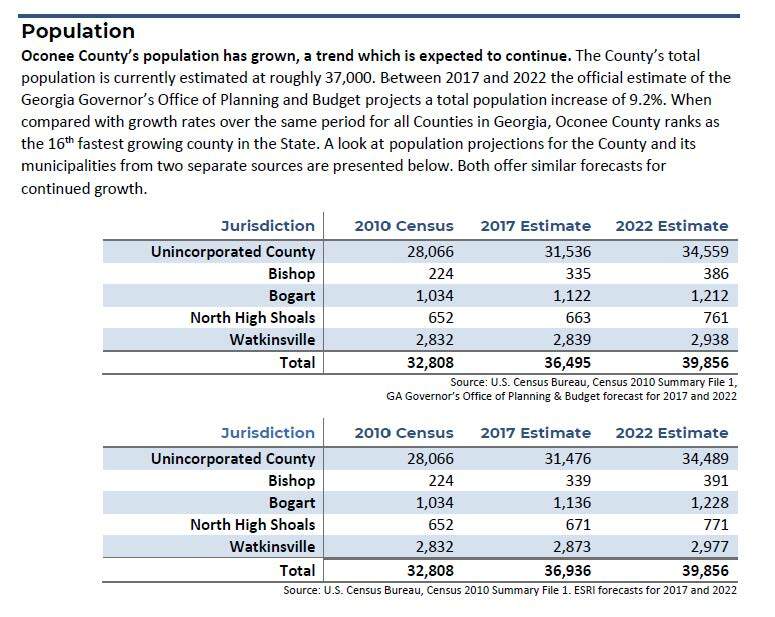 Much of the document overall is boilerplate materials dealing with population growth, demographics and the county’s history. 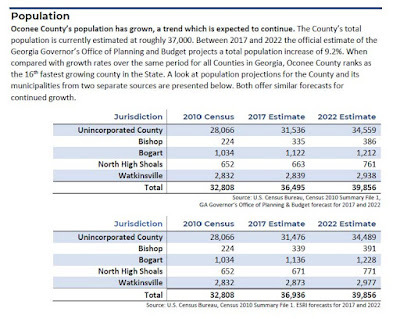 The county’s population in 2017 was 36,495, based on projections from the 2010 Census, and is expected to grow to 39,856 by 2022, the draft document states. The median age in Oconee County is 40.8, which is more than 5 years older than for the 12-county region with which it was compared, according to the report. The cohort aged 45-54 currently makes up the largest percentage of the population at 15.5 percent of the total. By 2022 the cohort aged 55-64 will be the county’s largest, with 14.9 percent of the total, according to the report. The Stakeholders Committee met on Dec. 6 at the Community Center in Oconee Veterans Park so the three working subcommittees could report back to the full Committee. The video below is of that meeting. Penny Mills recorded the video. OCO: Comp Plan Stakeholders Committee 12 6 17 from Lee Becker on Vimeo.